The chief investment officer of Australia’s $141 billion sovereign wealth fund has called on more investors to reconsider how they invest in hedge funds, which have evolved from “have a hunch, bet a bunch” traders to conservative technology-driven institutions. 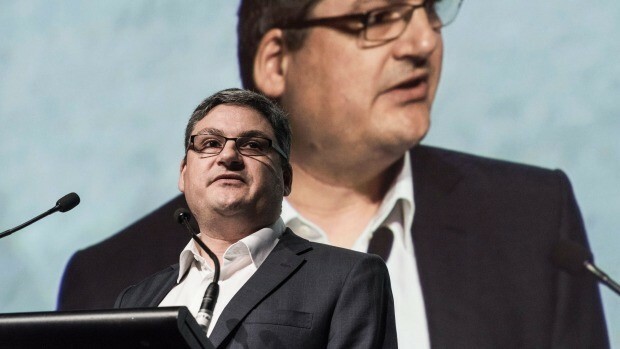 In a speech delivered at an exclusive gathering in Torquay, Victoria on Friday, the Future Fund’s Raphael Arndt outlined how the Future Fund’s $22 billion hedge fund programme had evolved to make sure it could continue to generate positive returns even if global equity markets took a turn for the worse. Dr Arndt said the hedge fund world had changed significantly in recent years. The hedge funds depicted in the popular TV show Billions were “no longer relevant”, he said. Instead the funds that reinvested $1 billon per annum into their own businesses, had more than a thousand computer programmers and collected over 10,000 independent proprietary data sources, better captured the modern hedge fund. “High-speed data analysis and multi-faceted risk systems have more value in modern markets than stock tips on the golf course,” Dr Arndt said at the i3 Investment Strategy Forum on Friday. The Future Fund is one of the largest investors globally in hedge funds with a $22 billion programme, which equates to about 15 per cent of the entire portfolio. That proportion has remained fairly consistent throughout the past five years. Dr Arndt said his team had become better at ensuring they are no longer paying hefty fees for exposures that could largely be replicated in equity and credit markets. “I am not interested in paying hedge fund fees to buy equity market beta that I can buy for one or two basis points through a passive listed equities mandate,” he said. But Dr Arndt said investors should be prepared to pay fees to managers with true skill that can deliver returns that are un-correlated from equity and credit markets. The fund said it was prepared to pay fees to hedge funds so long as they were getting value for it, and said at least 50 per cent of the alpha generated should be kept by the investor. The Future Fund also backs multiple strategies with individual managers so if one performs and one doesn’t the overall fee paid to the hedge fund is reduced. “This is one driver towards the smaller number of large relationships that is evident in our portfolio,” he said. Dr Arndt also took aim at some “brand name” hedge funds “too big to be able to move their portfolios around, and too fat and comfortable from their base fees to want to take any significant risk”. The Future Fund has 21 hedge funds appointed across three strategies – multi-strategy/relative value, macro-directional and alternative risk premium. They include some of the best known names in the industry such as Blackrock, Bridgewater, Brevan Howard and Citadel, but also lesser known funds such as London-based Glen Point Capital that was backed by George Soros. “The industry has evolved and improved, and features a new breed of managers that are different from their predecessors. They have changed their approach,” Dr Arndt said. A year ago at the same event, Dr Arndt explained how the fund had refined its approach to selecting equity managers, signalling a shift away from high fee charging active funds. 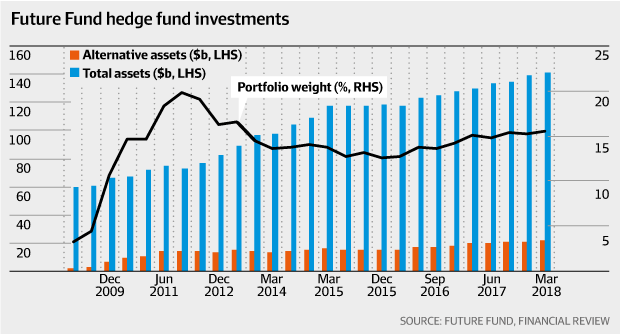 Interestingly, the Future Fund now only has a single Australian equities manager – Macquarie Investment Management. Dr Arndt said the Future Fund’s hedge fund programme was intended “to reduce risk – and in particular to provide returns during market environments involving prolonged periods of losses in equity markets”. So far, equity markets have held up well. But Dr Arndt reiterated the fund’s cautious long-term outlook, and risks created by rising populism and protectionism and persistently low interest rates.